While many of the baked goods of Scandinavia are found in identical or similar form in each of the countries, there is one whole category of baking in which the Danes hold a uniquely superior position — pastry. No one else can make pastry as good as the kind they can - none quite so light or with so many tissue-thin layers. It is not just for Christmas - it is a year-round source of delight and it does not seem likely the world will tire of it anytime soon. The rest of the world calls this Danish pastry, but the Danes call it wienerbrod, Vienna bread, which might seem like excessive modesty on their part, but in fact is not. Its origins are indeed Viennese. About one hundred years ago the bakers of Copenhagen went on strike, demanding cash wages instead of the traditional room and board. The employers retaliated by firing the Danish bakers and importing Germans and Austrians to replace them. It was not long before Viennese pastry became popular, for no Dane had ever used the Viennese method of folding butter into the yeast dough. 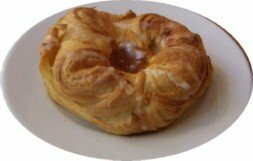 When the Danish bakers, pragmatic fellows, finally returned to their jobs, they copied the techniques of the Viennese, and then, being Danes, went on to improve the pastry by adding jam and other kinds until the 16th and 17th Centuries, when coffee and sugar were introduced to the North. The rest - as they say - is history. One of the most memorable impressions of a visit to Copenhagen may be the delicious pastry - unequaled in many travelers opinion. What is called Danish in the United States is a poor imitation and bears scant resemblance to the delicacy, richness and refinement of the pastry Danish bakers create. Be sure to try the pastry for yourself when you arrive in Copenhagen!